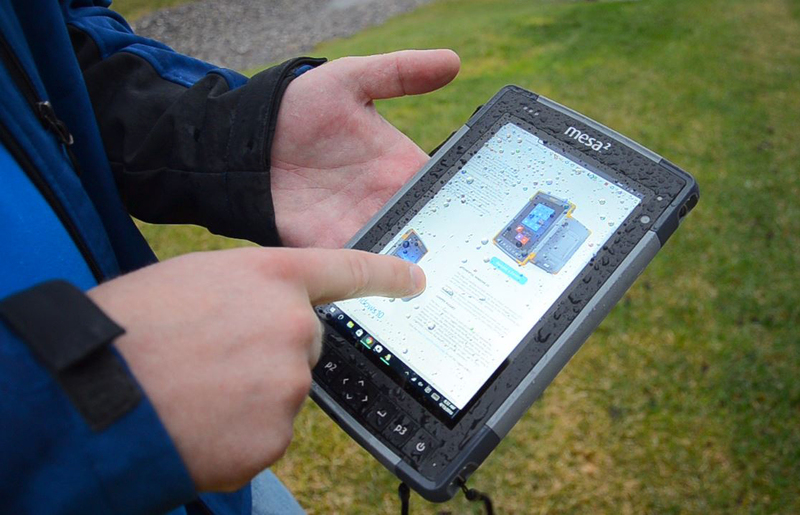 The capacitive touch screen on the Mesa 2 Rugged Tablet™ is very different from the resistive touch screen on the original Mesa Rugged Notepad™. Capacitive touch screens appear brighter and can provide greater clarity and contrast, increased durability, and multi-touch capabilities. They are also different from resistive touch screens because while resistive touch screens respond to pressure, capacitive touch screens detect and measure anything that is conductive, so that the slight touch of a fingertip or capacitive stylus triggers a response. While capacitive technology offers many advantages, the drawback is that sometimes, inadvertent contact with the screen can register as a command (you can relate to this if you’ve ever typed out a completely different word than you intended to on your phone because your finger accidentally brushed against the wrong letter). Another instance in which this drawback is apparent is when using a capacitive touch screen in wet or rainy conditions. Now, most people probably don’t even realize that water droplets on their touch screen can cause interferences, since having water on a consumer device is usually something people regularly try to avoid… HOWEVER, for those who work with rugged devices in harsh environments, working in wet and rainy conditions is a common occurrence, and so this becomes an issue. 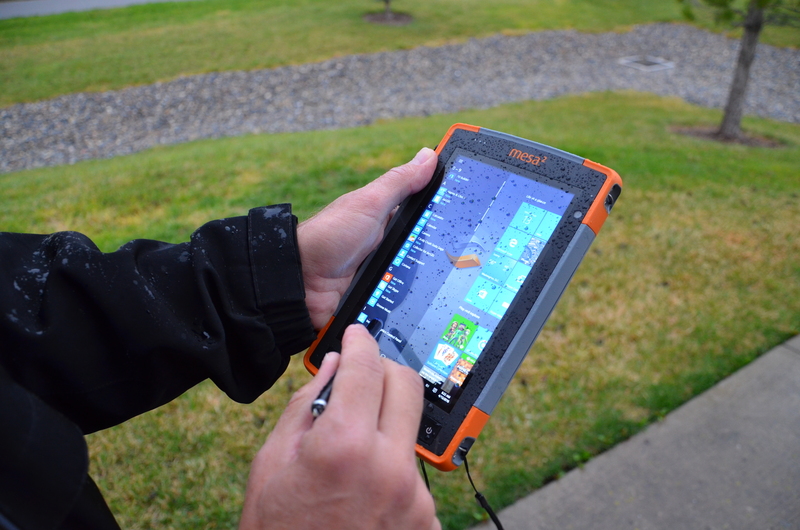 This is an industry-wide problem, and with the Mesa 2 Rugged Tablet, we made finding a solution one of our top priorities. As a result, we have developed customized “touch profiles” that adjust the touch screen settings based on the environment the user is working in. These touch profiles were first used with the Archer 2, and now, the hardware in the Mesa 2 has allowed us to further fine-tune these profiles, resulting in significant improvements. The Mesa 2 is by far the best-performing capacitive touch screen in wet environments that we have seen yet! For optimal touch screen performance, use the following profiles according to the conditions you’re working in. To change profiles, simply use the Profile Switcher app located on the desktop or the Windows 10 menu of the Mesa 2. By simply switching on the wet profile, users are able to use the Mesa 2 without false touches triggered by water droplets. With the wet profile switched on, the Mesa 2 touch screen recognizes a fingertip or the extreme-weather fat-tip stylus apart from water droplets and responds appropriately. We recommend that the wet profile be activated whenever the user is working in a wet environment. Watch the video below to see just how effectively the Mesa 2 performs in the rain. By default, the Mesa 2 comes with the dual profile enabled, which allows users to easily navigate the touch screen using either their fingertip or a fine-tipped stylus. Although this profile works great for most touch input, users may find that it is not as responsive as they might like for some specific applications. The dual profile also does not support Palm Suppression technology, which decreases false touches that can sometimes be triggered by the palm or hand resting on the screen. To take advantage of Palm Suppression technology, we recommend that users switch to the stylus profile. The stylus profile allows the Mesa 2 touch screen to be more responsive and reactive when used with the fine-tip stylus, but simultaneously disables the ability to use a fingertip to navigate the screen. This profile also provides Palm Suppression technology. If users want to use their finger to navigate again, they’ll have to switch profiles. For those who prefer to use their fingertip to navigate the touch screen, we’ve developed the finger profile. The finger profile is calibrated to work with a larger surface area such as the fingertip, or the extreme-weather fat-tip stylus. The fine-tip stylus will not work well, if at all, when the finger profile is activated. Coming soon, the Mesa 2’s glove profile will provide a better response to the touch of gloved fingers, enabling users to wear many types of gloves while collecting data. We have tested a variety of gloves with this profile in order to provide the best user experience possible and have been seeing very positive results. We are confident that with the correct touch profile, the Mesa 2 will respond well in any of the unique environments in which data needs to be collected, accessed, or generated. 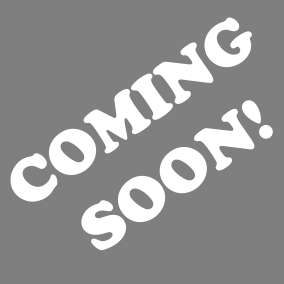 As always, we continue to look for ways to improve the data collection process, and we feel that these touch profiles will greatly improve your experience. Click here to learn more about the Mesa 2. Questions? Feel free to contact us online or by phone at 435-753-1881. I’m a Product Manager at Juniper Systems, where my responsibilities range from increasing the profitability of existing products to developing new products. I assist with utilizing existing ideas to build new products, and help to develop new ideas based on my industry experience and contact with customers and prospects. I enjoy spending time in the market to understand various problems and finding innovative solutions for the broader arena. Outside of the office, I love spending time with my family and our dogs.